Cartozia Tales has a team of core creators who are working on every issue, but these cartoonists will move around the world as the stories are told. 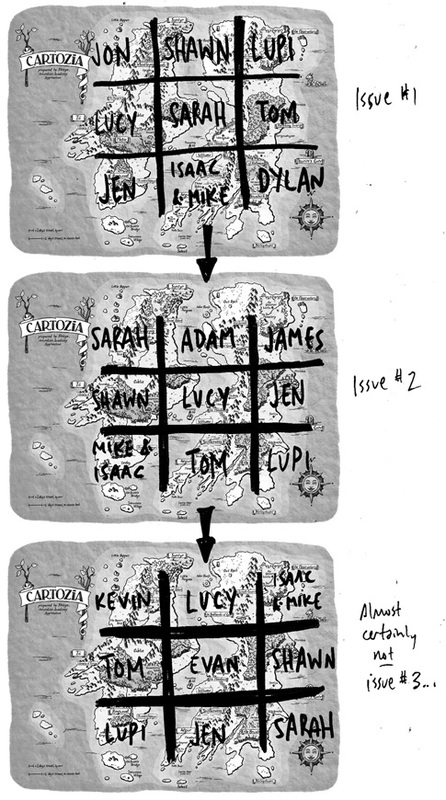 With every new issue, each creator is assigned at random to a sector of the map where he or she hasn't worked before. Each new issue will also bring in two guest cartoonists to tell stories in the other parts of Cartozia. The turn from one issue to another means that the new cartoonist in an area gets to decide what happens next for the characters and stories in the previous issue. If Isaac & Mike wind up in the northeast sector, will they tell a story of Nonie and Ottie, or of Master Zin and Wizzix? If the southwest sector goes to Lupi, will she continue Sylvia's search for lost songs, or will she tell a separate story about the Two Old Men of Kwantafapayo? Lucy or Tom would make different decisions. Only time (and the luck of the draw) will tell how our stories unfold! For us, this is one of the most fun things about Cartozia: we are really creating it together, and the only limits on our stories are placed by the stories we've told. We've loaded the map with a lot of places, and a lot of potential for exploration—and every new issue will explore more of the world we're sharing!